American stand-up comedian and a self-proclaimed ‘biryani extremist’ Jeremy McLellan had the adventure of a lifetime during his recent trip to Pakistan, where he not only lived out his wildest dreams of tucking into the spiciest food on the planet but also took away unforgettable memories of the place with him. A comedian based in Charleston, South Carolina, Jeremy was touring parts of Pakistan over the past 14 days, conducting stand-up comedy shows and providing free dental care to villagers around Islamabad through a fundraising initiative, all the while also keeping his fans updated with his day-to-day escapades on social media. 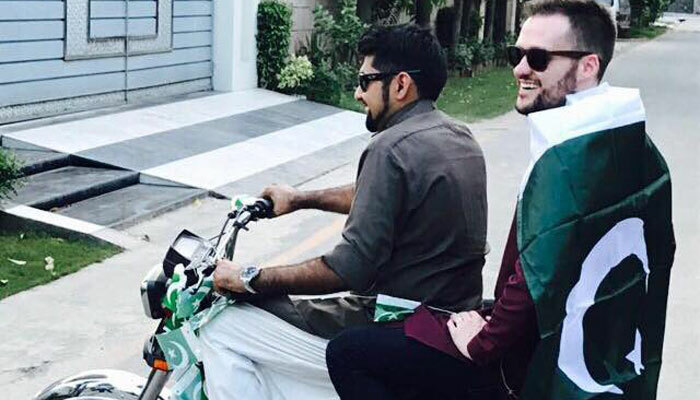 The ever-sunny Jeremy had the time of his life celebrating Pakistan’s Independence Day on August 14, in the true spirit of a ‘Pindi boy’. “Spent the day in Lahore and saw some of the biggest celebrations in my life… Never seen anything like it and (despite the email that the State Department sent me) it was completely safe,” he posted on his Facebook after driving around Lahore all night clad in a green kurta – his best memory of Pakistan. “Riding around Lahore on August 14 out of the sun-roof of an SUV while live-streaming the event on Facebook. I'll never forget that,” he told Geo.tv. He had his own share of some first-world-person-meets-third-world problems, such as falling sick after being served tap water bottled in mineral water bottles, but he harbours no bad feelings. “Everything went great. Couldn't have asked for a better experience,” he told us. With all the inquisitiveness of a man with a travel bug, Jeremy made a stop at the Wagah border..
and had a field day “training Pakistani spy pigeons to carry out top secret missions across the border” in honour of Indian Independence Day, as he put it. He was also fascinated by the mini ‘Paris’ and ‘Egypt’ he got to visit along the way. When asked about the biggest cultural shock he experienced here, Jeremy said he was surprised to see the strong sense of family and community in Pakistan, compared to his native US. “I love the thing where you bow to aunties and they put their hand on your shoulder. Handshake after hug, not before. (In the US it's either the opposite or you only hug.) I've had lots of weird tangled embraces because I messed it up. Classic white people problems,” he quipped. It is impossible to be in Pakistan and not have your fair share of cricket. Asked about his adventures with the bat, Jeremy had an air of resignation around him (it’s okay, buddy. It’s not an easy sport). A lot of great food and, of course, chai, kept him happy throughout his trip. “I love chai here. Nothing like when you buy it in the US,” he wrote in a post. Jeremy still has a lot left to explore, though. He spent his days in Islamabad, Lahore and the places surrounding the two cities. “Still lots more to do when I come back. Have to do Karachi and the Northern Areas,” he said. We asked him to sum up Pakistan in three words. “Hospitality, food, and love,” he was quick to respond, and promised he plans to return here next Spring or Fall.